Over 1000 primary school pupils in Lincolnshire will be given the essential life skill of learning to ride a bike thanks to one of Balanceability’s largest ever contract wins in the East Midlands. The programme, which is part of Telford-based TTC Cycling, has joined forces with sports charity Inspire+ to supply 24 schools in the area with 10 x 14” balance bikes, 10 helmets and all the training materials required to deliver the UK afPE approved ‘Balanceability’ learn-to-cycle programme. 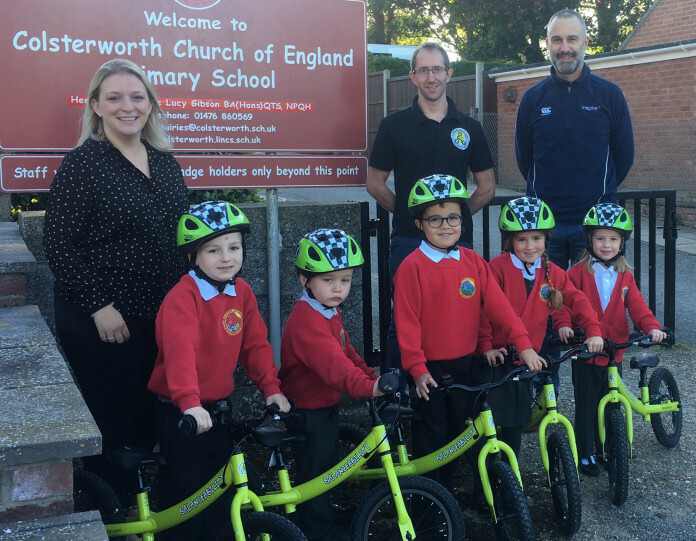 Colsterworth Primary School, Belmont Community Primary School and Uffington Church of England Primary School were amongst the first schools to receive their new bikes and will immediately get to work teaching Reception and Key Stage 1 pupils how to ride. Samantha Wright, Sales Manager of Balanceability, explained: “We work with thousands of schools across the country, with most of our relationships being held directly with individual schools. Inspire+ is a unique sports charity which serves schools across South Kesteven and Lincolnshire. Founded by Vincent Brittain in 2011, it aims to improve the lives of young people through sport and healthy active lifestyles, working with primary schools to provide a comprehensive package of support that includes teacher training, pupil leadership development, The Legacy Challenge and pupil mentoring. The service to secondary schools focuses on providing leadership training and opportunities for students who want to gain experience, skills and knowledge of sports coaching and volunteering or staging sporting events. “I had the aim of offering our member schools the opportunity to give Reception/Key Stage 1 pupils the chance to learn to cycle on balance bikes having seen the difference it made to my son. This was in my mind when I attended the Lincolnshire PE Conference and this is where I first came across Balanceability,” added Vincent.